With Capela out for an extended period of time and the lack of a quality back-up center on the roster, the Rockets are expected to trade for a big man in hopes of staying in top half of the Western Conference playoff bracket. While NBA and Rocket fans would love to see a blockbuster trade for Marc Gasol or Anthony Davis, that’s not going to happen. Expect the Rockets to be very eager to make a trade following the Capela injury. They desperately need help at the Center position. Robin Lopez would be an excellent fit. Instead, the Rockets are likely to make a smaller trade using a combination of bad contracts and draft picks to acquire a solid veteran from a rebuilding team. Below I have put together seven possible trades that Rockets could make to improve their big man situation. Knight’s contract is the most likely piece that will be used in any trade as he has played in just 12 games this season, averaging 9.8 minutes per game. With Harden, Chris Paul and Austin Rivers taking up most of the backcourt minutes, Knight is not needed. However, he is due $15.6 million dollars next season, making him even less appealing. However, to a rebuilding team that doesn’t matter as long as there is draft capital coming back as well. The Magic are currently just outside the playoff picture but realistically they are not making the playoffs and should be thinking about next season. Vucevic is having a career year, averaging 20.1 points per game. However, he is a free agent after the season and isn’t likely to return, with first-round pick Mo Bamba as the future at center. Maybe Knight can revive his career in Orlando, maybe not, but getting a first round pick for a soon to be leaving free agent is a win for the Magic. While Vucevic won’t provide the defense and rim protection Capela has, Vucevic will give the Rockets a pick and pop center who is shooting a career-high 38% from three this season. Once Capela returns, Vucevic can become a focal point of the second unit. This deal is very similar to the Vucevic trade, the only difference is Lopez would provide a defensive presence that Vucevic won’t. However, he doesn’t offer much offensively, but neither does Capela. Lopez will bring a veteran toughness that won’t mind doing the dirty work under the basket. The Bulls are in full-blown rebuilding mode and want to trade Lopez before the deadline. If they can get back a first round pick for Lopez, the Bulls should be content with paying Knight next season. Once again this is a trade of Knight’s poor contract to a rebuilding team with a draft pick for a big man. Unlike the previous two trades, Henson is under contract next season for $10.5 million dollars and the Rockets aren’t likely to give up a first round pick for him because of it. However, Henson might be the best fit to replace Capela because of his length and shot blocking ability. Earlier this season the Cavaliers acquired Henson in a trade from the Milwaukee Bucks that netted them a future first-round pick, but since arriving in Cleveland, Henson has yet to play in a game. Clearly, the Cavaliers have no interest in using Henson so swapping him for Knight, who could provide some veteran leadership to rookie Collin Sexton, while not adding any major long term salary would be an excellent move. Getting back a second-round pick is just frosting as the Cavaliers need to add as many draft picks as possible. Alright, let’s move off of Knight for a minute and talk about a very small trade involving Anthony instead. For those of us that forget, Anthony is still on the Rockets’ roster even though he hasn’t played since early November and his $1.5 million dollar contract is exactly the same as Frye’s. The Rockets can send enough cash to cover Anthony’s release from the Cavaliers and a second round pick for their trouble. While Frye offers the Rockets’ zero defense, he is a pick and pop center and if you can shoot threes, you can fit in with the Rockets. This trade should happen even if they make another move for a more traditional big man. Back to trades involving Knight. This is very similar to the Henson trade where two teams are swapping players neither team wants. Young center Thomas Bryant has taken over as the starter in Washington and Mahinmi has been glued to the bench most games this season. Unfortunately for the Wizards, Mahinmi is owed $15.5 million dollars next season and has very little to no trade value. However, he can defend and protect the rim, making him of some value to the Rockets. The Wizards might be the best landing spot for Knight. With John Wall done for the season after undergoing heel surgery, the Wizards don’t have a lot of depth at point guard. Tomas Satoransky has done a good job as the starter but the back up is Chasson Randle. Since the Wizards have a slight upper hand in this trade and have no second-round draft picks till 2023, they get back a likely late second-round pick. Enough with the one-for-one trades, let’s make things interesting. 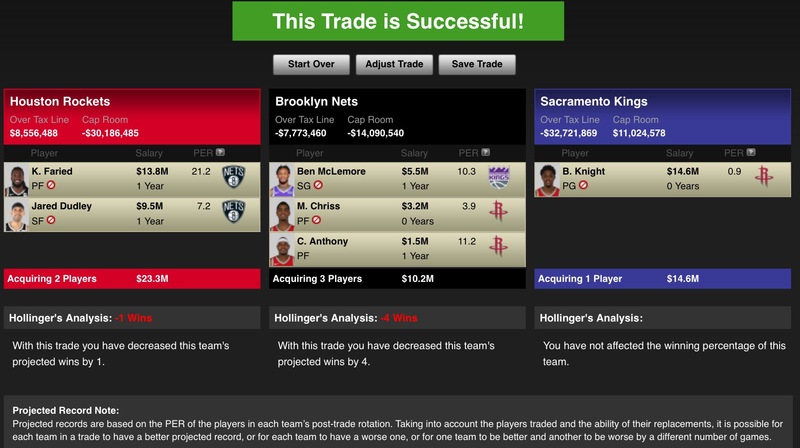 In this trade, the Rockets solve two problems in one move. The Hawks are one of the worst team in the league and are willing to trade just about anyone not named Trae Young. Dedmon is on an expiring contract and would fit what the Rockets need to replace Capela perfectly. Meanwhile, the other big need for the Rockers is the small forward spot. Ever since Trevor Ariza left as a free agent, the Rockets have struggled to fill his spot with a good defender who can also shoot. Both Bazemore and Ariza are shooting around 33% from three this season and both provide good defense and energy. Snagging both Bazemore and Dedmon would make the Rockets clearly the second best team in the West. For the Hawks, they will use the cash to cover Anthony’s release (for the second time in six months). Knight can provide some veteran leadership for Young, while Hartenstein was a second-round pick in 2017 and could develop into something if given more minutes while Marquese Chriss is a former top ten pick on an expiring contract. The Rockets have shown they don’t care about trading draft picks away as they were reportedly ready to give up four first-round picks for Jimmy Butler earlier this season. For the Hawks, they have all their picks over the next four drafts plus an extra first-round pick from the Cavaliers and Dallas Mavericks. 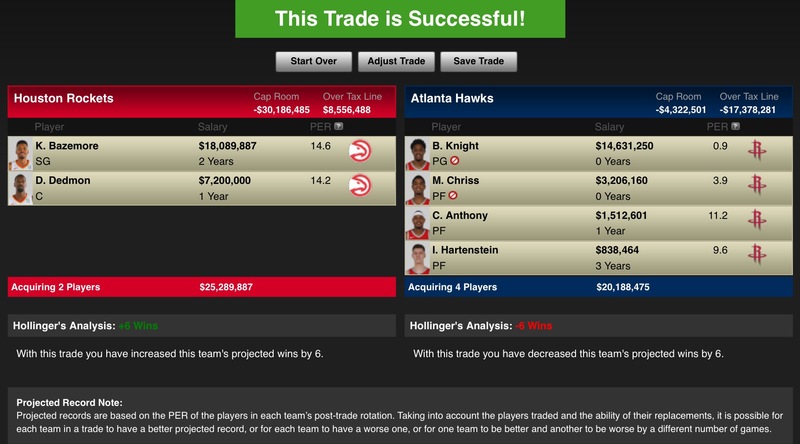 The more draft picks the better for the Hawks and adding three for two players they don’t want anymore is a steal. Finally, a three-team deal! Honestly, this only needs to be a three-team deal because the Nets don’t want to take on Knights’ contract for next season. The Nets are projected to have plenty of cap space this summer and are hopeful to add a big-time free agent or two, so taking on salary for next season won’t happen. Instead, the Nets take on all the expiring contracts. Both Faried and Dudley are free agents after the season and won’t be resigned by the Nets, but they give the Rockets exactly what they need. Faried is a bouncy and long player who will fill Capela’s role while Dudley provides defense, three-point shooting and is a good locker room guy. The Nets get back a second round pick for two players they won’t resign along with half a season to take a look at former top ten picks, McLemore and Chriss. While the Kings are in the middle of the race for the eighth seed in the Western Conference, McLemore isn’t the reason why. He has played in just 17 games this season, averaging 8.4 minutes per game. Thanks to the Kings $11 million dollars in cap space, they can take back Knight while only sending out McLemore’s $5.5 million dollar contract. Knight can provide veteran leadership for De’Aaron Fox and for the trouble of paying Knight next season, the Kings get a likely late first round pick.